Traveling to a third world country to provide medical treatment was the reason I became a nurse. I always knew that helping the underserved and those who have nothing was what I truly wanted to do. 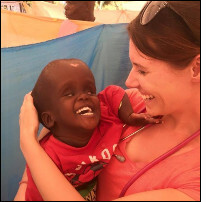 I chose to go to Uganda because not only does Africa have limited access to medical care, the medical care they do provide is extremely substandard. While in Uganda we had 8 days of clinic split between two communities in need. Three days we set up in a church in Kampala the capital city, this area is a major slum. Although this area is home to Mulago hospital, the largest hospital in Uganda, it provides very expensive care that many cannot afford, and often times hands out misdiagnosis and no follow up care to their patient. Then we moved to Nangiza a small farming town that is not even found on the map. There we set up for 5 days and treated patients from Nangiza as well as neighboring towns, some who had walked up to 15 miles barefoot just to receive medical care. In these towns clinics and hospitals are very far out of the way and the people in these areas are extremely poor so much of the “medical treatment” they receive is from pharmacy owners with no medical training. The 8 treatment days we were able to see and treat over 2,600 patients with conditions ranging from malaria, TB, burns, backaches, joint pain, extreme HTN and STD’s. We were able to deliver wound care, medication administration, and much of our treatment came from patient education. Unfortunately much of the medical information the patients are receiving in Uganda, even from the doctors and hospitals, is misinformation. The doctors in these areas have a list of conditions they use to describe almost all conditions, for fever, they automatically diagnose a patient with malaria, for joint pains, skin rashes and other unspecified sexual complaints, they diagnose a patient with syphilis, (even young boys and girls who have had no sexual contact), any chest or abdominal pain is diagnosed as ulcers. It was difficult when assessing patients to understand their true problems because many times they would come in with false ideas of what they had. Much of our time was spent correcting these false ideas. Many times women would come in complaining of pain with menstruation thinking this was and STD, because they had never been taught what was normal and abnormal about periods. The time spent in Uganda was a huge learning experience for me. I thought I was prepared for the conditions I was going to see while there, but after touring the towns and seeing peoples homes, living conditions and living their lifestyle for 2 weeks, I realized how wrong my perception was. What was most overwhelming was through they endure some of the most difficult conditions, these people are the most happy, grateful kind and content people you could ever meet. They truly have touched my heart. I cannot wait to return to Uganda, "the pearl of Africa."